Something very strange is happening around Virginis IX, and the two powers controlling the galaxy, the Roman Catholic Church and the Eridani Caliphate want to know what is going on. Lying on the edge of their space, the Caliphate sends their own ships to investigate, while the Church sends Father Mallory undercover in Mosasa’s group. I’m sure Swann goes into further detail about the two religious governments histories and creations in previous novels, but to me, they were just two neighboring governmental groups, as apposed to two religious groups. It’s interesting though, to come across religious governments in science fiction, as so much SF tends to be belief neutral. There may be religious characters, but none of them come off as preachy. My favorite character had to be Nickolai. His whole race is the product of genetic engineers on earth who wanted to create a slave race of ultimate soldiers. A history of Catholicism, yet created by humans, the tiger race created a fascinating religion. Nickolai, once a crown prince on his homeworld, yet now banished to Bakunin is intriguing, yet tragic. His only reason for joining Mosasa’s team is a twisted path towards redemption, and I constantly wanted to learn more about him – his beliefs, his past, and the creation of his race at the hands of people who thought they had the best intentions . Believing it to be too dangerous to jump directly in the Virginis IX space, both Mosasa’s team, and the Caliphate’s team lead by Admiral Hussein, find themselves in orbit around Salmagundi, a planet in self imposed exile due to their taboo beliefs about genetic engineering and immortality. Removed from communication with the rest of humanity for nearly 200 years, the residents of Salmagundi follow a type of mind melding, where citizens have the minds of upwards of ten of their ancestors downloaded into their own minds. This allows knowledge to flow freely through multiple generations, and provides a strong case for immortality. On Salmagundi, the more ancestors you carry in your head, the higher your status. When part of Mosasa’s team crash lands on Salmagundi and is rescued by Flynn Jorgensen, they discover part of what happened at Virginis IX, and part of who Mosasa really is, where he really came from, and what he is truly capable of. Mosasa may act the part of a gambler and petty crime lord and mercenary chief, but the survival of humanity may be in his hands. Ending on a cliffhanger, I hope Swann doesn’t make us wait too long to find out the destiny of those who find themselves linked to Virginis IX. In the meantime, I can catch up on his Hostile Takeover novels. 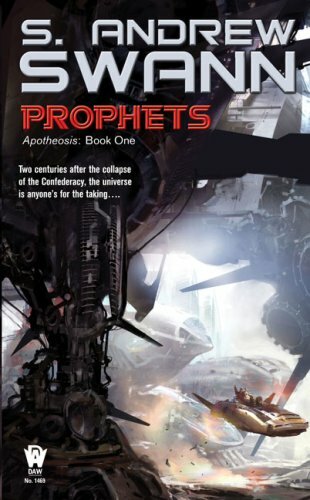 1 Response to "Prophets, by S. Andrew Swann"